We are so excited to announce that we will be awarding $5,000 through the Aubrey Pappas Memorial Scholarship. 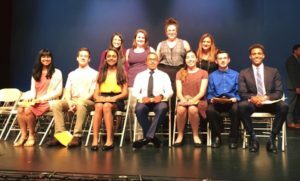 These awards will be given to North Brunswick Township HS Seniors who applied through Naviance/Guidance Department and selected by our Scholarship Committee. We invite all to join the NBTHS Community on Wednesday June 5th at the Awards Night at the High School when the recipients for ours and all other Scholarships and Awards will be announced. 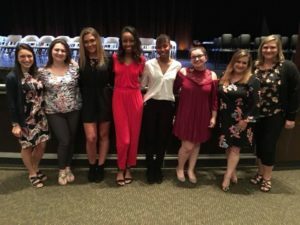 CONGRATULATIONS to our 2018 Aubrey Pappas Memorial Scholarship Recipients: Naomi Gobena, Deanna Graulich, Sarah Kessler, Karine Lozewski & Kayla McCargo! The Aubrey Pappas Memorial Scholarship is so important to our organization. 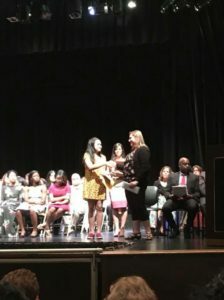 For the past 3 1/2 years, since Mrs. Pappas’s accident, we have worked hard to raise money in the North Brunswick community to be able to offer this scholarship to the students of North Brunswick, because Aubrey loved working in the North Brunswick school district and she loved teaching North Brunswick students. So, we have chosen to continue her legacy by investing in the North Brunswick students TOO – it’s one of the greatest ways we can honor Aubrey Pappas. Our hope is that each recipient keeps in touch with The Aubrey Foundation – we want to hear all about your success and how you will continue to Live Like Aubrey in your college communities and beyond. We’d like to thank the 19 students who took the time to write and submit essays for the 2018 Aubrey Pappas Memorial Scholarship – we loved reading every single one of them! This year, we awarded FIVE $1,000.00 scholarships to graduates who exemplify the traits that Mrs. Aubrey Pappas instilled in each of her students: strong academic and family values, perseverance through challenges, acceptance of others’ uniqueness, and a great sense of ambition. All of the essays that were selected also exhibit how each student plans to continue to Live Like Aubrey in their years ahead. Naomi Gobena (Charity/Community Service): Naomi is extremely compassionate toward others and open-minded, especially when it comes to learning about different cultures and lifestyles across the globe. Aubrey herself came from a diverse background and embraced uniqueness. Naomi’s appetite to explore and take risks is refreshing and reminds us of Aubrey’s vibrant spirit. Naomi also loves to learn and is committed to continue her education in college and pursue a career to help children in some capacity. Deanna Graulich (Charity/Community Service): Deanna has a heart for service – her undeniable selflessness is truly humbling. Like Aubrey, Deanna understands the value of helping others here in our own North Brunswick community. We appreciate everything she has done over the years to support North Brunswick students & children with special needs. We also thank her for continuing to Live Like Aubrey every day through her volunteer efforts across various local organizations, including The Aubrey Foundation. Sarah Keller (Health/Nutrition): Sarah realizes the importance of physical health and its impact on the body and mind. She plans to major in nutrition in college so she can help others who struggle with weight and body image. Being brave enough to talk about these sensitive topics is inspiring: making others feel comfortable and confident in their own skin and being physically fit and healthy are all things Aubrey did so well! We thank Sarah for continuing to Live Like Aubrey in such a special way. Karine Lozewski (The Arts): Karine is a student who is passionate about the Arts, just like Aubrey was. In her essay, Karine used colorful language to express her love for drawing, painting, and designing. Karine has clear future plans to attend Pratt Institute next fall where she will pursue a career in Arts Education and 2D Animation in hopes to teach and positively influence others to express themselves creatively. Click Here to read about The Aubrey Pappas Memorial Scholarship and our essay prompts. Preeya Dave: Preeya is a student who is passionate about writing and the English language. She plans to study Journalism and Media Studies in college and then wants to pursue a career in a related field where she an use words, stories, or media to positively influence others and be an advocate for acceptance. Pawel Dzielski: Pawel is a student who has a heart for service; he realizes the value in helping others. His undeniable selflessness and support for his local community is inspiring. We wish him best of luck as he pursues his passion of becoming a Firefighter, and thank him, in advance, for his service! Nicole Jimenez: Nicole is an aspiring teacher. She is motivated to positively influence students. She finds joy in helping others and recognizes the delicacy and diversity of students’ circumstances and needs. Michael Kovacs: Michael is an inspiring individual whose perseverance has led him to overcome some challenging obstacles, particularly in the realm of academia. We admire his openness, willingness to work hard, and determination to stay focused on his studies. He is committed to continuing his education at the college level and further explores his career interests. Jordan Leonardo: Jordan realizes the importance of physical health and its impact on both body and mind. He was injured during his sophomore year and through his physical therapy developed a ‘positive force’ mindset. He plans on becoming a therapist to help others discover and build up their positive force. Jeffrey Montoya: Jeffrey is a student who had Mrs. Pappas in 6th grade, and because of her strong influence plans to become an educator as well. His desire to inspire all of his future students, especially those with special needs, radiates the effect Mrs. Pappas had on him and how he will continue to #LiveLikeAubrey. Mosam Naik: Mosam is a student who understands the importance of embracing students’ differences and seeing the potential each individual has. She is planning to pursue a career in teaching and vows to run a classroom centered on respect and encouragement. Andrew Popow: Andrew wants to be a leader in our government. He realizes that, like Mrs. Pappas, one must be dedicated, fair and cooperative to not only be inspirational but also to be affective in the right way. In a time of political turbulence, we found it heartwarming and encouraging that this student recognizes the value that our voices matter, especially in politics & government. We know that he will do amazing things with his passion and commitment to making this world a better place.